Najlaa Elageli wanted to provide an uncompromising platform for Libyan artists and creatives. In 2012, she founded one of the first arts organisations focusing on Libya. Since then, she has curated nine successful international exhibitions held in London (UK), Malta, Tripoli (Libya) and California (US). She has also collaborated with both the Shubbak and Nour Festivals in London. Najla has also been recognised for her passion in highlighting the voices of Middle Eastern women. 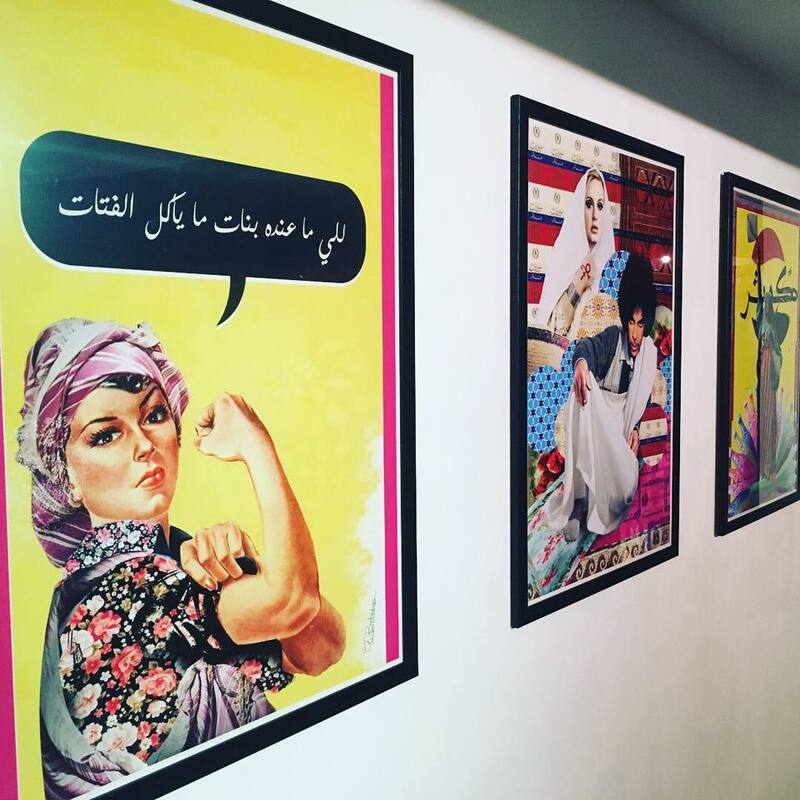 In 2016 she curated the Textural Threads’ exhibition in London in collaboration with Arts Canteen and brought the work of six emerging female artists from the Arab world to an international stage. Similarly, the “Jeweled Tales of Libya” exhibition (2016) focused on telling the stories behind antique Libyan jewelry and vignettes in an attempt to enrich different narratives surrounding Libyan women today. Her most recent exhibition, Pop Art from North Africa (2017) boasts art from each country in North Africa. Through a relatively newly established art form in the Middle East, the exhibition provided a glimpse into how change and renaissance is possible through creating new literature about the thoughts, conflicts and day to day struggles in the region. Through her work, she hopes to shed light on the different voices in and out of Libya and to challenge perceptions of women. BANAT’s Farrah Fray, a Libyan poet and creative herself, talks to Najla about her inspiration, upcoming projects, and overcoming the challenges that face Libyan women in creating art. How did Noon Arts begin? Why do you think it was important to create it? A journey began circa 2012 when I established Noon Arts, a small private arts foundation, to explore the new burgeoning Libyan arts scene that was borne out of the revolutionary spirit and heralded a new creative movement. Noon Arts was to spot and nurture the work of talented local artists and bring their work to the international stage. I felt it was important to shed light on Libya’s cultural scene as Libya is considered a cultural desert by not only outsiders but by Libyans themselves. 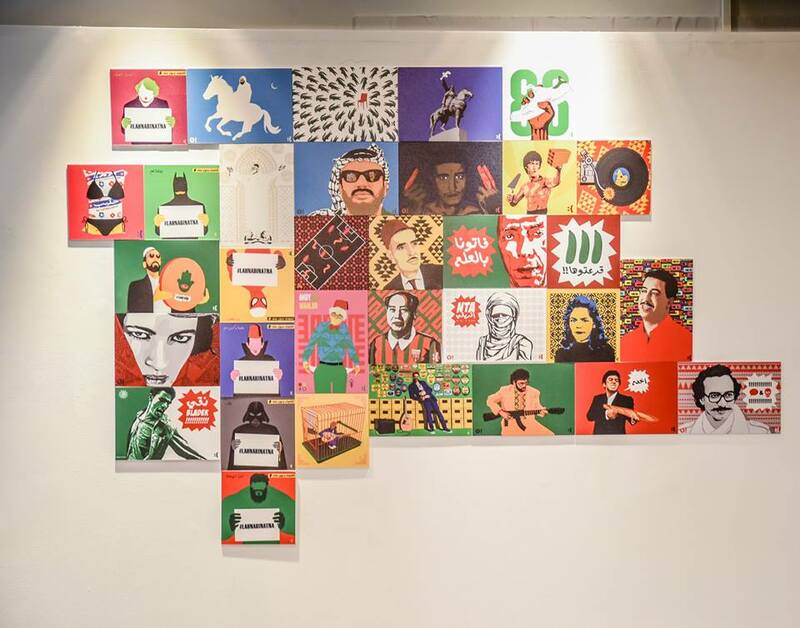 Why do you believe that it’s important for Libyan creative to showcase their art internationally? It is to show the rest of the world what Libya’s artists are doing; and, importantly, to offer the artists a wider and more diverse audience where broader critique can happen and where dialogue is opened. Tell me about the current art scene in Libya. Five years post-Revolution, the art scene is experiencing a kind of a halt unfortunately, due to a new type of political turbulence that has created a constant fear of attack. However, there are lots of small grassroots initiatives, such as Tanaourat in Benghazi, where artists are creating their own cultural space that seems to draw new talent. This year you put together an exhibition with Toufik Douib about North African Pop Art. Why pop art? Pop Art is an accessible art form that easily reaches out to the masses. In the West, pop art started from the simple logic of re-appropriation and reinvention that soon grew into an industry for dreams and evasion. It spoke to the masses, engaged with minorities and turned into a cultural phenomenon. So similarly, in North Africa, pop art addresses what the people want and it reflects on both the existential and the local social issues. It often delivers its message through hints of nostalgia and subtle provocation with politically charged connotations. In fact, beyond the colourful symbols and codes soaked in derision and sarcasm, the pop artists who are active today in the region, from Egypt to Morocco, tackle themes inspired by history, tradition; and, above all, the challenges of their everyday life. When selecting the works Toufik and I wanted to showcase the eclectic and fresh views through their paintings, digitally-manipulated images, installation, video and sound. What were your thoughts after the Pop Art from North Africa exhibition? Was there a piece or artist from that exhibition that struck you the most? Throughout the exhibition, I realised that there are so many artistic links and threads in the region that could lead to more interesting collective exhibitions for the future. As for artworks that struck a cord with me, I would say Qarm Qart’s Yaa Gazma (Shoe), Alla Abudabbus's Haja Hurryia (Freedom) and Ilyes Messaoudi's Scheherazade collection. The Jewelled Tales of Libya exhibition you organised last year takes us back in time, with some pieces dating back to 1920. What inspired you and what was your process? Collecting Libyan antique silver jewellery is one of my passions and not just for the pleasure of wearing the pieces. The antique jewellery reveals the multilayered tapestry of Libya's history and cultural heritage, mainly found in the symbolic icons and designs evident in the detail and the workmanship. So the jewellery has become a beautiful source of information that has much to teach us about the past and the evolution of Libyan culture. How do exhibitions such as the Jewelled Tales of Libya map Libya onto the Middle East and world? The exhibition shed light on the geography of Libya and it being an integral commercial passageway. We know that the jewellery that was designed and made in Tripoli during the late nineteenth century up until the mid-twentieth century was sought after all the way to Swia in Egypt, to Tunisia and Eastern Algeria. Creating art in a region that is conservative can often be seen as provocative. What is your opinion on that? This is very true. Artists in the whole region seem to be censoring their work before it reaches the public domain. Artists in Libya specifically are aware of how extremists may view their art as provocative and challenging if it asks too many questions. It all depends on how the receiver or the viewer sees the work, and there is always the probability that if he does not like it, then he may well create a religious scenario that could lead to the end of the artist and his craft. I have a big project for next year that will look at Libya’s contested history and collective memory. It is the first ever project that will honestly look back at modern day Libya and its traumatic past as well as to shed light on its social fabric and the cultural landscape. What message would you like to give to other Libyan female creatives? Libyan creatives are doing amazing work both in Libya and also within the diaspora outside the country. I have also noticed that the female creatives seem more confidant in pushing the boundaries and challenging the status quo. Their work is inquisitive and subtle at the same time, much more then their male counterparts.